Manatees are common throughout Crystal River. 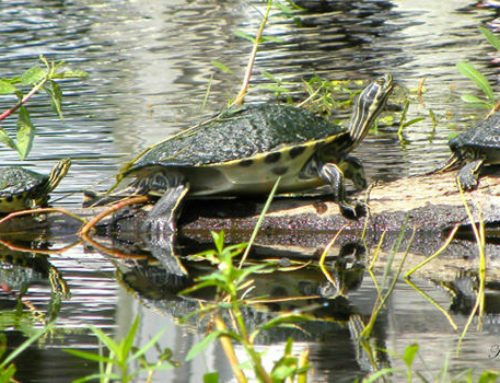 These gentle giants have been calling the Springs home since before Florida was established as a state. However, in recent years the loss of fresh water eelgrass and the rise of Lyngbya has all but killed off their food supply. 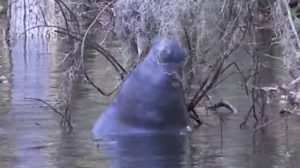 A manatee leaps out of water to eat Spanish moss. Manatees (Sea Cows) are herbivores, meaning that they only eat plants. In fact, manatees and the closely related dugongs are the only plant-eating marine mammals. These friendly beasts can weigh over 1000 pounds. Manatees need to eat 7-15% of their body weight per day but only forage for food about 7 hours of the day. When hundreds of manatees come into Kings Bay in the winter, they don’t have enough to eat. 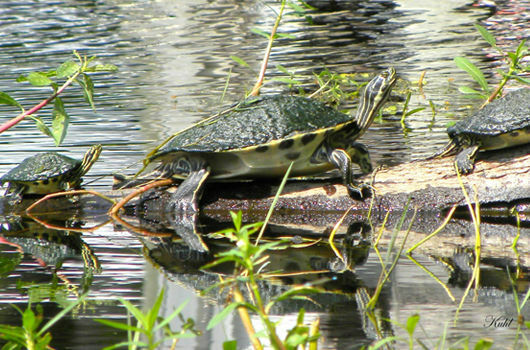 To get enough food, they must swim our to the Gulf of Mexico, where sea grass meadows provide food. But making that two day journey away from the warm springs can expose these giants to waters too cold for their bodies. At times when the weather gets frigid, it might be tempting to just toss a few bales of hay into the water for each of the cows to eat, but that’s really not a good idea. Florida law prohibits feeding manatees. The next best thing to do is help create more “grazing” area. Lush eelgrass meadows are a great source of nutrients for the hungry manatees. 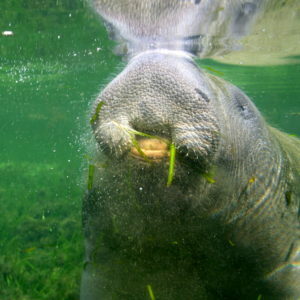 A manatee will graze on up to 1.2 acres of eelgrass per day. Luckily, when eelgrass is well-established the manatee cannot pull out the roots of the plant. The manatee will chew off the leaf blades. The strong rooted plants will grow back the leaf blade and in the process take up more nutrients from the water. In this manner, the manatees help to improve water clarity. Sometimes the manatees may find an eelgrass plant before it had time to establish a root base. In that case, the manatee will accidentally pull up the whole plant to eat as pictured below. A manatee pulls up the eelgrass and roots. We must work together to protect the manatees vital food source of eelgrass. As we remove Lyngbya from Kings Bay, we improve the manatee’s winter habitat. The springs with a constant temperature of 72o F harbors many manatees from the cold waters of the Gulf of Mexico. If food is not readily available as submerged aquatic vegetation, then manatees end up acting as lawn mowers to neighbor’s back yards and leaping out of the water to eat moss from trees. Crystal River is the only place in the world to swim with manatees. We are responsible to keep this vital ecosystem safe and protected to keep the manatees thriving.